From the Hancock County Court House, go 2.6 miles northeast on Hwy 22/15 to the split and then go right on Hwy 22 for another 10.3 miles to the Powelton Baptist Church on your right. The church is at the corner of Jones Bridge Road (County Rd 27) and Hwy 22. The Powelton Baptist Church, first known as Powell's Creek Church, was constituted July 1, 1786, with 26 members by the Rev. Silas Mercer, the Rev. John Harvey, and the Rev. John Thomas. The Rev. Jesse Mercer became pastor of this church on Feb. 4, 1797, and served in that capacity until late in 1825. During his ministry, 200 persons were baptized into the church. The General Committee of the Georgia Baptists was organized here in 1803; the Baptist State Convention was formed in this church in 1822, and its sessions were held here in 1823 and in 1832. 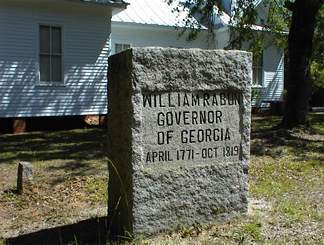 Governor William Rabun was a distinguished member of Powelton Baptist Church and served it as Clerk and Chorister. 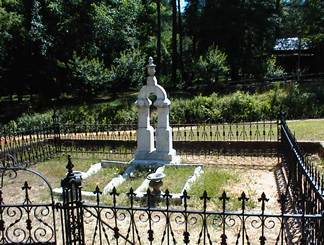 "Father" "Come forward" On same gravestone as M. C. Veazey. "Mother" "Asleep in Jesus" On same gravestone as P. G. Veazey.